William Jefferson "Bill" Clinton (born William Jefferson Blythe III on August 19, 1946) was the 42nd President of the United States, serving from 1993 to 2001. 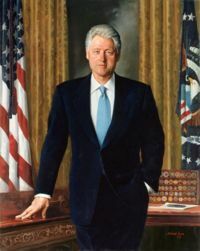 Before his election as President, Clinton served nearly 12 years as the 50th and 52nd Governor of Arkansas. His wife, Hillary Rodham Clinton, is the junior United States Senator from New York, where they both reside. Clinton founded and heads the William J. Clinton Foundation. William Jefferson Blythe III was born in Hope, Arkansas, and raised in Hot Springs, Arkansas. He was named after his father, William Jefferson Blythe, Jr., a traveling salesman who died in a car accident three months before he was born. His mother, born Virginia Dell Cassidy (1923–1994), remarried in 1950 to Roger Clinton. Roger Clinton owned an automobile dealership business with his brother, Raymond. The young Billy, as he was called, was raised by his mother and stepfather, assuming his last name "Clinton" throughout elementary school but not formally changing it until he was 14. Clinton grew up in a traditional, albeit blended, family; however, according to Clinton, his stepfather was a gambler and an alcoholic who regularly abused Clinton's mother and sometimes Clinton's half-brother Roger, Jr.
Bill Clinton as a child went to St. John's Catholic School and Ramble Elementary School. While at Hot Springs High School, Clinton was an excellent student and a talented saxophonist. He considered dedicating his life to music, but a visit to the White House to meet then-President John F. Kennedy following his election as a Boys Nation Senator led him to pursue a career in politics. Clinton was a member of Youth Order of DeMolay but never actually became a Freemason. Clinton received a Bachelor of Science in Foreign Service (B.S.F.S.) degree from the Edmund A. Walsh School of Foreign Service at Georgetown University in Washington D.C., where he became a brother of Alpha Phi Omega, worked for Senator J. William Fulbright, was elected to Phi Beta Kappa and won a Rhodes Scholarship to University College, Oxford. While at Oxford, he played rugby union as a lock, and later in life he played for the Little Rock Rugby club in Arkansas. There he also participated in the Vietnam War protest movement. After Oxford, Clinton obtained a Juris Doctor (J.D.) degree from Yale Law School in 1973. While at Yale, he began dating classmate Hillary Rodham. They married in 1975 and their only child, Chelsea, was born in 1980. Clinton is a member of Kappa Kappa Psi National Honorary Band Fraternity, Inc. In 1974, his first year as a University of Arkansas law professor, Clinton ran for the House of Representatives. The incumbent, John Paul Hammerschmidt, defeated Clinton with 52% of the vote. In 1976, Clinton was elected Attorney General of Arkansas without opposition in the general election. In 1978, Bill Clinton was first elected Governor of Arkansas, the youngest to be elected governor since 1938. His first term was fraught with difficulties, including an unpopular motor vehicle tax and popular anger over the escape of Cuban prisoners (from the Mariel boatlift) detained in Fort Chaffee in 1980. There was some media speculation in 1987 that Clinton would enter the race for 1988 Democratic presidential nomination after then-New York Governor Mario Cuomo declined to run and Democratic frontrunner Gary Hart bowed out due to revelations about marital infidelity. 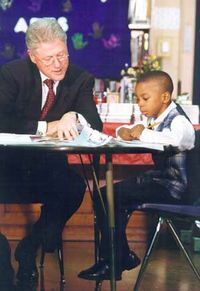 Often referred to as the "Boy Governor" at the time because of his youthful appearance, Clinton decided to remain as Arkansas Governor and postpone his presidential ambitions until 1992. Presenting himself as a moderate and a member of the New Democrat wing of the Democratic Party, he headed the moderate Democratic Leadership Council in 1990 and 1991. In 1992, Clinton was the early favorite of Democratic Party insiders and elected officials for the presidential nomination; therefore, he was able to rack up scores of superdelegates even before the first nominating contests were conducted. In spite of this, Clinton began his 1992 presidential quest on a sour note by finishing near the back of the pack in the Iowa caucus, which was largely uncontested due to the presence of favorite-son Senator Tom Harkin, who was the easy winner. Clinton’s real trouble, however, began during New Hampshire Primary campaign, when revelations of a possible extramarital affair with Gennifer Flowers began to surface. Clinton and his wife Hillary decided to go on 60 Minutes following the Super Bowl to rebut those charges of infidelity, which had started to take their toll, as Clinton had fallen way behind former Massachusetts Senator Paul Tsongas in the New Hampshire polls. In fact, his campaign was beginning to unravel. Their TV appearance was a calculated risk, but it seemed to pay off as Clinton regained some of his lost footing. He still finished second to Tsongas in the New Hampshire Primary, but the media viewed it as a moral victory for Clinton, since he came within single digits of winning after trailing badly in the polls. Clinton shrewdly labeled himself “The Comeback Kid” on election night to help foster this perception and came out of New Hampshire on a roll. Tsongas, on the other hand, picked up little or no momentum from his victory. Clinton used his new-found momentum to storm through the Southern primaries, including the big prizes of Florida and Texas, and build up a sizable delegate lead over his opponents in the race for the 1992 Democratic presidential nomination. However, there were still some doubts as to whether he could secure the nomination, as former California Governor Jerry Brown was scoring victories in other parts of the country and Clinton had yet to win a significant contest outside of his native South. With no major Southern state remaining on the primary calendar, Clinton set his sights on the delegate-rich New York Primary, which was to be his proving ground. Much to the surprise of some, Clinton scored a resounding victory in New York. It was a watershed moment for him, as he had finally broken through and shed his image as a regional candidate and as centrist Democrat whose standing with Northern liberals was questionable. Having been transformed into the consensus candidate, he took on an air of inevitability and was able to cruise to the nomination, topping it off with a victory on Brown’s home turf in the California Primary. Clinton won the 1992 Presidential election (43.0% of the vote) against Republican George H. W. Bush (37.4% of the vote) and billionaire populist H. Ross Perot, who ran as an independent (18.9% of the vote) on a platform focusing on domestic issues; a large part of his success was Bush's steep decline in public approval. Previously described as "unbeatable" because of his approval ratings in the 80% range during the Persian Gulf conflict, Bush saw his public approval rating drop to just over 40% by election time. Additionally, Bush reneged on his promise ( "Read My Lips: No New Taxes!") not to raise taxes when he compromised with Democrats in an attempt to lower the Federal deficits. This hurt him among conservatives. Clinton capitalized on Bush's policy switch, repeatedly condemning the President for making a promise he failed to keep. Finally, Bush's coalition was in disarray. Conservatives had been united by anti-communism, but with the end of the Cold War, old rivalries re-emerged. The Republican Convention of 1992 was dominated by evangelical Christians, alarming some moderate voters who thought the Republican Party had been taken over by religious conservatives. All this worked in Clinton's favour. Clinton could point to his moderate, 'New Democrat' record as governor of Arkansas. Liberal Democrats were impressed by Clinton's academic credentials, his 1960s-era protest record, and support for social causes such as a woman's right to choose. Many Democrats who had supported Ronald Reagan and Bush in previous elections switched their allegiance to the more moderate Clinton. His election ended an era of Republican rule, including 12 consecutive years in the White House and 20 of the previous 24 years. That election also brought the Democrats full control of the political branches of the federal government, including both houses of Congress as well as the presidency, for the first time since 1980. Clinton's presidency included the longest period of economic growth in America's history. Clinton made cutting the deficit a top priority of his presidency. He supported and signed the Omnibus Budget Reconciliation Act of 1993. 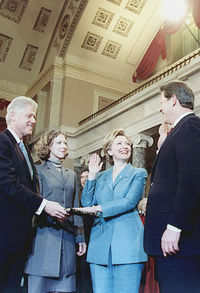 The Clinton Administration had a domestic agenda that included successful passage of the Family and Medical Leave Act of 1993 and the North American Free Trade Agreement (NAFTA). Clinton was unsuccessful in his attempt at a universal health care reform program, known as the Clinton health care plan. The foreign policy of the Clinton administration dealt with conflicts in Bosnia and Herzegovina, Haiti, and most notably the Kosovo War. 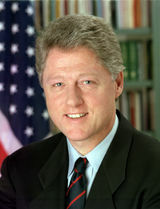 In 1998, as a result of allegations that he had lied during grand jury testimony regarding his sexual relationship with Monica Lewinsky, a young female White House intern, Clinton was the second U.S. president to be impeached by the House of Representatives (the other being Andrew Johnson). The House held no serious impeachment hearings before the 1998 mid-term elections: Republican candidates rarely mentioned the issue of impeachment, but Democrats generally came out strongly against impeachment. In spite of the allegations against the President, his party picked up seats in the Congress. The Republican leadership called a lame duck session in December 1998 to hold impeachment proceedings. On February 12, the Senate concluded a 21-day trial with the vote on both counts falling short of the Constitutional requirement of a two-thirds majority to convict and remove an office holder. The final vote was generally along party lines, with all of the votes to convict being cast by Republicans. On the perjury charge 55 senators voted to acquit, including 10 Republicans, and 45 voted to convict; on the obstruction charge the Senate voted 50-50. Clinton, like the only other president to be impeached, Andrew Johnson, served the remainder of his term. The White House travel office controversy began on May 19, 1993, when several longtime employees of the White House Travel Office were fired. A whistleblower's letter, written during the previous administration, triggered an FBI investigation which revealed evidence of financial malfeasance. President Bill Clinton has been criticized for some of his presidential pardons and other acts of executive clemency. Clinton issued 140 pardons on his last day in office ( January 20, 2001). It is common practice for Presidents to grant a number of pardons shortly before leaving office, but Clinton's last day list was more numerous than those of many previous presidents. Most of the controversy surrounded Marc Rich and allegations that Hillary Clinton's brother, Hugh Rodham, accepted payments in return for influencing the president's decision-making regarding the pardons. Two claims of sexual misconduct on the part of Bill Clinton were alleged by Kathleen Willey and Juanita Broaddrick, during the Clinton Administration. Neither claim resulted in charges against Clinton. 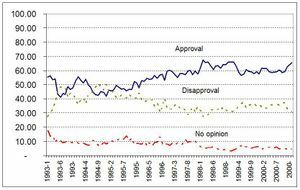 While Clinton's job approval rating varied over the course of his first term, ranging from a low of 36 percent in mid-1993 to a high of 64 percent in late-1993 and early-1994, his job approval rating consistently ranged from the high 50s to the high 60s in his second term. Clinton's approval rating reached its highest point at 73 percent approval in the aftermath of the impeachment proceedings in 1998 and 1999. A CNN/USA TODAY/Gallup poll conducted as he was leaving office, revealed deeply contradictory attitudes regarding Clinton. Although his approval rating at 68 percent was higher than that of any other departing president since polling began more than seventy years earlier, only 45 percent said they would miss him. While 55 percent thought he "would have something worthwhile to contribute and should remain active in public life", and 47 percent rated him as either outstanding or above average as a president, 68 percent thought he would be remembered for his "involvement in personal scandal" rather than his accomplishments as president, and 58 percent answered "No" to the question "Do you generally think Bill Clinton is honest and trustworthy?" 47 percent of the respondents identified themselves as being Clinton supporters. In May 2006 a CNN poll comparing Clinton's job performance with that of his successor, George W. Bush, found a majority of respondents said Clinton outperformed Bush on every single issue in question. As the first Baby Boomer president, Clinton was the first president in a half century not shaped by World War II. With his sound-bite-ready dialogue and pioneering use of pop culture in his campaigning, such as playing his saxophone on The Arsenio Hall Show, Clinton was sometimes described as the " MTV president". Until his inauguration as president, he had earned substantially less money than his wife, and had the smallest net worth of any president in modern history, according to My Life, Clinton's autobiography. Clinton, a charismatic speaker, tended to draw huge crowds during public speeches throughout his terms in office. Clinton was also very popular among African-Americans and made improving race relations a major theme of his presidency. Like other former American presidents, Clinton has engaged in a career as a public speaker on a variety of issues. In his speaking engagements around the world, he continues to comment on aspects of contemporary politics. One notable theme is his advocacy of multilateral solutions to problems facing the world. Clinton's close relationship with the African American community has been highlighted in his post-Presidential career with the opening of his personal office in the Harlem section of New York City. He assisted his wife, Hillary Clinton, in her campaign for office as Senator from New York. Clinton's autobiography, My Life, was released in June 2004. On July 26, 2004, Clinton spoke for the fifth consecutive time to the Democratic National Convention, using the opportunity to praise candidate John Kerry. Many Democrats believed that Clinton's speech was one of the best in Convention history. In it, he criticized President George W. Bush's depiction of Kerry, saying that "strength and wisdom are not opposing values." He dedicated his presidential library, which is the largest in the nation, the William J. Clinton Presidential Centre, in Little Rock, Arkansas on November 18, 2004. Under rainy skies, Clinton received words of praise from former presidents Jimmy Carter and George H. W. Bush, as well as from the current president, George W. Bush. He was also treated to a musical rendition from Bono and The Edge from U2, who expressed their gratitude at Clinton's efforts to resolve the Northern Ireland conflict during his presidency. On December 9, 2005, speaking at the United Nations Climate Change Conference in Montreal, Clinton publicly criticized the Bush Administration for its handling of emissions control. Further, Clinton twice visited the University of California, Los Angeles in 2006 to promote initiatives concerning the environment. First, on August 1, 2006, he met with Tony Blair, Ken Livingstone, Antonio Villaraigosa, and Gavin Newsom to advertise the Large Cities Climate Leadership Group. On October 13, 2006, he spoke in favour of California Proposition 87, which was voted down. On September 9, 2004, Clinton had an episode of angina and was evaluated at Northern Westchester Hospital. It was determined that he had not suffered a coronary infarction, and he was sent home, returning the following day for angiography, which disclosed multiple vessel coronary artery disease. He was transferred to Columbia Presbyterian Medical Centre in New York City, where he underwent a successful quadruple coronary artery bypass surgery on September 6, 2004. The medical team claimed that, had he not had surgery, he would likely have suffered a massive heart attack within a few months. On March 10, 2005, he underwent a follow-up surgery to remove scar tissue and fluid from his left chest cavity, a result of his open-heart surgery. On May 3, 2005, Clinton announced through the William J. Clinton Foundation an agreement by major soft drink manufacturers to stop selling sugared sodas and juice drinks in public primary and secondary schools. There had been reported signs of a friendship growing between Clinton and George H.W. Bush. After the official unveiling of his White House portrait in June 2004, the Asian Tsunami disaster, Hurricane Katrina, and the 2004 election, Clinton and Bush met, although the nature of the meetings did not appear to include a reconciliation of political opinions. On January 3, 2005, President George W. Bush named Clinton and George H. W. Bush to lead a nationwide campaign to help the victims of the 2004 Indian Ocean earthquake. On February 1, 2005, he was selected by UN Secretary-General Kofi Annan to head the United Nations earthquake and tsunami relief and reconstruction effort. Five days later, Clinton appeared with Bush on the Super Bowl XXXIX pre-game show on Fox in support of their bipartisan effort to raise money for relief of the disaster through the USA Freedom Corps, an action which Bush described as "transcending politics." Thirteen days later, they traveled to the affected areas to see the relief efforts. On November 22, 2004, New York Republican Governor George Pataki named Clinton and the other living former presidents (Gerald Ford, Jimmy Carter, and George H. W. Bush) as honorary members of the board rebuilding the World Trade Centre. In 2005, the University of Arkansas System opened the Clinton School of Public Service on the grounds of the Clinton Presidential Centre. On March 5, 2006, he received an honorary doctorate of humane letters from Pace University, and is the first recipient of the Pace University President's Centennial Award. Following reception of the honorary degree, he spoke to the students, faculty, alumni and staff of Pace, officially kicking off the centennial anniversary of the university. Also in 2006 Clinton was awarded the J. William Fulbright Prize for International Understanding.